The deep-sea long-term observatory HAUSGARTEN was established as one of the ESONET key sites (http://www.esonet-emso.org) to detect and track environmental changes in the transition zone between the northern North Atlantic and the central Arctic Ocean, and to determine experimentally key factors controlling deep sea biodiversity. The need of a wide scale of depth ranges in order to identify the relevance of ocean depth implied its location in the vicinity of Molloy Hole. Within the EMSO (European Multidisciplinary Seafloor Observatories) initiative listed in the ESFRI roadmap, HAUSGARTEN as the 'Arctic site' is one of the five preselected deep-sea observatories explicitly nominated as prime candidates for a cable connection. Due to the fact that Fram Strait is the only deep connection where exchanges of intermediate and deep waters between the Nordic Seas and the Arctic Ocean take place, it is one of the key sites identified by the Arctic Regional Ocean Observing System (Arctic ROOS; Sandven, 2005) and the integrated Arctic Ocean Observing System (iAOOS; Dickson et al, 2008) as suggested by the Arctic Ocean Sciences Board (AOSB). An oceanographic array of 16 moorings has been operated since 1997 in the frame of different projects, including EU VEINS (Variability of the Exchanges in the Nordic Seas), EU ASOF-N (Arctic-Subarctic Ocean Fluxes - North), EU DAMOCLES IP (Developing Arctic Modeling and Observing Capabilities for Long-term Environmental Studies) and a variety of national institutional funding contributions, to monitor the ocean water column properties and oceanic advective fluxes (Fahrbach et al, 2001; Schauer et al, 2008). The strong dependence of ocean currents on bottom topography in particular in weakly stratified polar oceans required the physical oceanography observations in the area of the smallest bottom gradients, implying a spatial distance to the HAUSGARTEN with clearly controversial requirements. In recent years a wide scope of new technologies for monitoring volume and heat exchanges (acoustic tomography, oceanographic sections by gliders, Fig. 2) and for data transfer from the moored arrays (acoustic modems) have been developed (in the DAMOCLES IP) and are under implementation (in the ACoustic technology for OBserving the interior of the ARctic ocean project, ACOBAR). Yet until now, the HAUSGARTEN deep sea observatory and oceanographic/tomography moorings have been maintained as separate instrumented modules with taking only little advantage of complementary measurements and an integration of existing and planned infrastructure. The planned cable connection of HAUSGARTEN to a land base would provide an unique opportunity for integration of all stand alone measurements in the Fram Strait area into the multidisciplinary and sustainable observatory (Fig. 1), enclosing both the benthic and ocean water column and capable to provide a wide range of in-situ measured quantities operationally in near-real time (NRT). The ARCOONE DM aims at working out the optimal technical solutions for interfaces and delivery of data collected by moorings to the cabled node as well as in establishing common standards for data transfer. Scientific quality and effectiveness of integration arises from enhancing the ongoing ecosystem observations in HAUSGARTEN with comprehensive monitoring of physical environment, which will provide a significant added value for long-term tracking of the global change as well as studying processes on shorter time scales. Integration of a variety of new technologies employed in the Fram Strait area into a consistent and optimized monitoring system will lead to cost efficient field work, improved strategy of deployments, data sampling and the optimum combination of diverse data sets available for the whole community. Technological networking of different components of the Fram Strait observing system requires both definition and development of hardware and establishing common standards and protocols for transfer and integration of diverse data sets. Lastly, western Svalbard (as the designated Arctic ESONET site) is the focus of the HAUSGARTEN and Kongsfjord long-term observing that monitor biological oceanography across the continental slope and shelf of western Fram Strait. These have been recently linked by the KONGHAU project that is funded by StatoilHyrdo linking the two projects. The addition of AOEM (with both MASOX and ARCOONE) will provide a new dimension to the observing programme. Such multi-disciplinary research will build “critical mass” at a site (globally important both as the Fram Strait oceanographic gateway, and where climate change feed-backs dissociate hydrate), and hence consistent with its designation as one of the five proposed EMSO sites worthy of future multi-node, cabled observatory infrastructure. We wish to take advantage of the opportunity offered through AOEM to create links between the different research groups and form the core for a more coherent and coordinated approach to Arctic seafloor observatory research that will last beyond the current ESONET / EMSO projects. 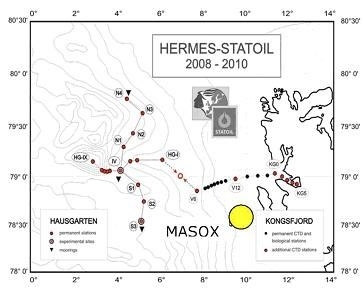 Locations of HAUSGARTEN, KONGSFJORD, and KONGHAU (from HERMES Newsletter), and proposed MASOX observatory (yellow circle) at the Arctic ESONET-EMSO site.